Well summer vacation is over and most people have begun to settle into the routine of fall, but here on the blog, we are extending summer just a little while longer as we have two more guests in the series: Summers Tune In Thursday Guest Blogs! I hope Y’all, have enjoyed the guests we’ve had so far. I have! Today’s guest is Gayl Wright. I first met Gayl in 2015 in the hotel lobby at a bloggers conference in Greenville South Carolina. We chatted and visited and was nice to connect a face with names I had been reading and seeing online. Can I just say, it is so much fun meeting online blogger friends in real life! Anyway, I am excited for you to get to know Gayl as well. She writes writes poetry, is often found participating in the 5-minute Friday community. Thank you Gayl, for sharing this encouragement with us today at Tune In Thursday. I encourage you to leave comments below for Gayl, and don’t forget to link up your posts below. Gayl Wright makes her home in upstate South Carolina. Will soon celebrate 43rd wedding anniversary, mother of 7, grandmother of 14, she is a seeker of truth who looks for beauty in ordinary things. She tries to capture what she finds using her talents to encourage others and glorify God. 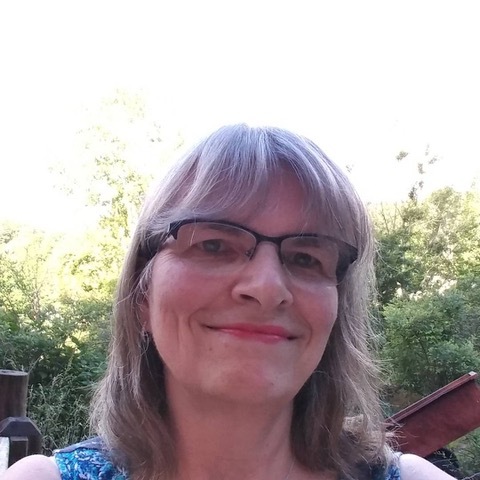 She loves to explore new areas of creativity as she writes for her blog, composes poems, and dabbles in her art journal. ARE YOU TIRED AND WEARY? Do you ever find yourself at a place where you feel like you can’t give any more? Are you burdened by demands that seem overwhelming? Do you wish for a way to find some relief? I like to think of myself as a person who empathizes with others. I love to encourage, but when I grow tired it can be difficult to reach out to help someone else. I suspect many of you can identify. We want to give, to inspire and encourage others, but sometimes we wonder how we can keep giving. Is it possible to find some time for ourselves? As Jesus walked this earth he got tired. I’m sure he struggled, too, with all the demands. Yes, I know he was God, but he was also human. He gave up his glory to come to earth to live as a human being. Walking those dusty roads I know he got thirsty, hungry and tired. Often when Jesus tried to get alone to rest, the crowds would follow him. He always had compassion and welcomed them, sometimes providing food and healing before sending them away. He somehow found the strength to go on a little longer before getting that needed time alone. Even when #Jesus was tired He had compassion towards others. Where Did Jesus Get His Strength? The Scriptures give us many instances where Jesus went off by himself to pray. Sometimes it was morning. Other times it was evening. He probably slipped away as often as he could in order to commune with his Father alone. I believe his strength came as he spent time in prayer with God. Sometimes he prayed all night. His work was to accomplish what God had planned. He knew the only way to do that would be to stay in close contact with his Father. We, too, can be strengthened to continue loving and reaching out to people by spending time with God in prayer. Maybe having an all night prayer session is out of the question for us, at least on a regular basis. A few minutes a day would be a good place to start. There are times when all I can do is offer up a cry for help in the midst of my exhaustion. In I Thessalonians 5:17, we are told to “pray without ceasing.” If I remember that God is always with me, then I know I can pray anytime, anywhere, even if it is just a breath prayer. Because He is with me, I know He hears me. My circumstances may not change, but God gives the strength to carry on. Worry is replaced with peace, the kind I cannot manufacture on my own. Are We Able to Help Everyone? In this world it can be very hard to know where we are needed most. There is no way we can help in every circumstance we hear about or see on the news. We may want to help, but there is only so much we can do without exhausting ourselves. It is hard to know when to work and when to stop and rest. We can ask God to show us where we can best use our talents and gifts. Often it is right in our own homes. He will give us wisdom and strength to go on when we are weak. Dear Gayl (& Debbie), thank you for acknowledging that even women of God get worn out and weary. Gayl, your empathy shines through and reflects that of our Savior. Blessings and prayers for a peace-filled, refreshing day. Blessings to you and Debbie both! Oh Kelly, I can so relate to the insomnia- I am praying for you my friend. Praying you get that babysitter and rest 🙂 thanks for being here today and sorry the linkup was missing, but it is now live. Hope you can come back and link up. Kelly, yes, we all need rest, but sometimes it’s awfully hard to do. I pray you will find some relief from you insomnia and get some good rest! Gayl, I love the way you encourage us to pray — and it occurred to me as I read that those little sentences, whispered over the kitchen sink or while we’re changing a diaper, add up to paragraphs and become an on-going conversation with God if we will turn our hearts toward Him more of the time. I can become so preoccupied with my thoughts that I’m thankful for reminders like this that I can shift weariness onto His strong shoulders, for He’s with me. And, Debbie, I think there’s a problem with the link this morning? The place for it has been marked, but it has not been inserted. Thanks, Michele. I love how you remind us that those little sentences add up and show us that we indeed have an ongoing conversation with God. Thanks so much for your comments. Gayl (and Debbie), this is a wonderful reminder to know when to rest. Jesus knew He was to be about His Father’s business, yet He knew when to come away from the crowd and be alone with His Father. May we make time to pray each day, for it is the only way to meet the demands of each day. Blessings! PS – I didn’t see a place to link up. Sorry! The link up is now live – I forgot to insert it – oops. I hope you are able to come back and linkup today. 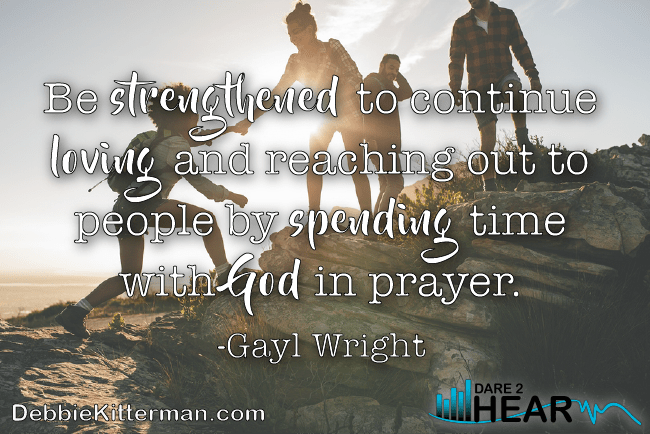 And I completely agree with you in regards to Gayl’s post – it is a wonderful reminder that we need rest and daily prayer conversations with God. Thanks, Joanne. I need the reminder as much as everyone else. So many times I forget to pray and then am reminded that we are to “pray without ceasing” and like Michele said if we turn our hearts toward God our sentences do become ongoing conversations with God. I love Gayl and seeing her here delights my soul. Smart lady. Susan, I completely agree with you! Gayl, I always find a quiet, peaceful spot on the internet when I visit your site. Your gentle voice shines through this post too. Thank you, Sarah. That encourages me a lot. Many blessings to you! Sarah – she does indeed have a gentle voice that comes through doesn’t she! thanks for encouraging Gayl with such beautiful words. I think we’re finally getting close to cleaning up after Irma – just have to rebuild parts of our fence and collect a few more limbs from the yard! Wow! Glad you’re getting close to finishing. I pray God will give strength as you continue to recover from Irma. Hi Debbie, and Gayl, we have comment on each other’s post before. Many days I feel beyond exhausted, that’s why I studied resting in the Lord. He had to rely on the Holy Spirit, and the lonely or solitary places are very necessary for refreshing. Hi Rebecca! Yes, just like Jesus, we need to rely on the Holy Spirit and He will give us rest and strength. Blessings to you! Thanks for being here. Hi Rebecca – yes, we have indeed commented on each others before 🙂 Refreshing and resting are so very much an important part of us being the best versions of ourself to accomplish the things placed before us. These are such great thoughts about resting and praying! And then to combine it with your most recent post about getting out in nature–wow! I believe that HE does want to meet us out in the fresh air, to give us fresh breath from HIM. Thanks to both you and Debbie for sharing this post today. Blessings to you! Bettie- I am so glad you have been following Gayl on her site as well, and that today’s post went so well with her other ones. Blessings to you as well. Thank you for your encouraging words, Linda! Yes, we don’t have to do it all today, even though we feel that way sometimes. May God bless and give you strength this night! Linda – I am so glad you could relate to Gayl’s words. God knows just what we need, and exactly when we are ready to hear it. Blessings to you! Gayle- I love talking about where Jesus got his strength. I love knowing that Jesus rested. This post goes along so well with my topic for this month. I am so glad I hopped on over here today. Debbie – Thank you for sharing. Thanks for your encouragement, Maree! I’ll have to check out your post. Maree – I am so glad you hopped over last week too. You are most welcome for sharing 🙂 Blessings to you. Thanks for this huge reminder. The problem I have is when I try to rest others make me feel guilty about it. It’s so hard when others make us feel guilty for doing what we know we should do. Even Jesus rested, so why shouldn’t we? May you find time to rest and may God bless you, Patrick. Marilyn, I’m so glad you were inspired. May God give you rest and blessing! you are most welcome Marilyn! Great inspiration as I sit here weary from an exhausting day at work! I’m so glad you were inspired, Roseann! May God give you sweet rest tonight and give you strength. Oh Rosann – I am sorry your are exhausted from work, but so very glad you were inspired by Gayl’s post. Your post goes live in a few days – YAY! no slipping away, no strength. that’s it! interesting that Jesus needed it as Deity but there it is. Yes, and I think it was important to Him, so should be to us, too. I know I need to do it more often. These two weeks of vacation I’m finding that I have more time to slip away, sit outside to relax and write and commune with God. yep, there it is.. such a good reminder isn’t it? Thanks for commenting Sue. This is such a refreshing reminder, Gayl. I love to think on the humanness of Jesus for this very reason. I need to relate to him and he allows that! It is beyond me how our Maker and GOD came to earth to relate to us, to save us. Thank you friend. Yes, Meghan, it shows us that he understands because he was also human and felt what we feel. It really is mind blowing that He would come here, humble himself and even die for us. So grateful for His love and mercy. Thanks for commenting. Blessings to you!